Description: A small (4.5-5.5mm) red-brown and black ground beetle found on riverine floodplains, particularly near the sea. Lives in crevices and among vegetation on riverbanks. Very local. World Distribution: A Eurasian Wide-temperate species (65) distributed across north and central Europe to southern France and east to central Siberia. Introduced to N. America. Irish Status: Largely coastal and very local. There is one inland record, for Clonbrock, Galway, given by Johnson and Halbert (1902). Ecology: Alluvial soil with some saline influence appears to be a common element in its Irish sites, and it may be to some extent halophilic. 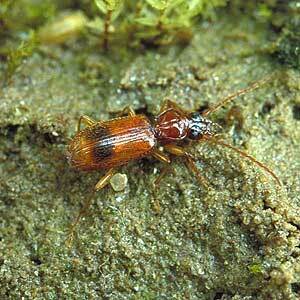 It occupies the same sorts of habitats as Trechus micros, although the latter has been recorded mainly inland.